OxyGeneo is a brand new treatment, referred to as the new “super facial”. It’s 3-in-1 action exfoliates, oxygenates and infuses skin with special ingredients. It is great for most skin types, gently brightening, softening and smoothing the skin, with results noticed after the first treatment. Because the OxyGeneo treatment simultaneously exfoliates, oxygenates and infuses nutrient-rich products deep into the skin, there is no downtime, no pain and results are seen immediately. Oxygen is essential for a glowing, youthful appearance. Most oxygen facials use a compressor to blow oxygen and serum onto the skin. This method is not as effective because the oxygen is unable to penetrate deeply, causing the results to last for only a short time. 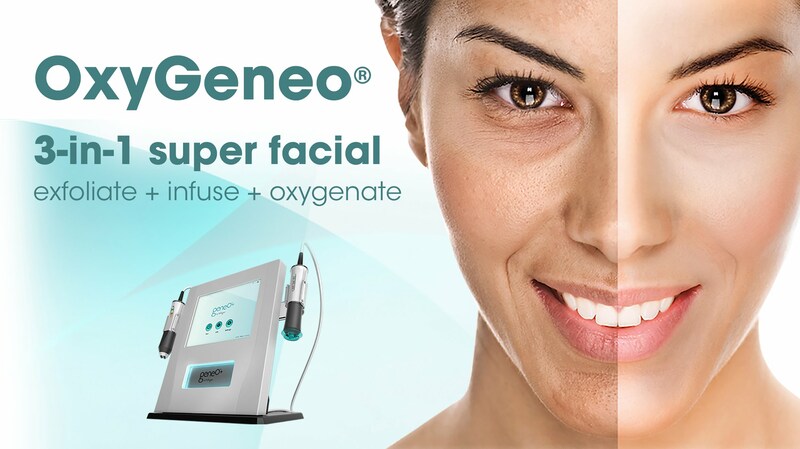 OxyGeneo® is a revolutionary 3-in-1 Oxygen facial that exfoliates, infuses and oxygenates the skin from the inside out. You will look and feel amazing after this anti-aging facial in Springfield Missouri. How Does OxyGeneo™ Oxygenate My Skin? OxyGeneo™ capitalizes on the Bohr Effect that was discovered by Christian Bohr in 1904. The effect indicates that when the CO2 (Carbon dioxide) concentration increases, the hemoglobin releases oxygen from within. The OxyGeneo™ applicator features a soft exfoliating head that, when combined with the treatment gel we place on your skin, creates a gentle chemical reaction creating carbon dioxide bubbles. That, in turn, triggers the Bohr Effect that oxygenates the skin naturally. The oxygenation is completely internal, which is great for sensitive skin. Oxygenating the skin is beneficial in all anti-aging and corrective skin procedures since it increases cell metabolism and makes the skin more receptive to the nutrients being infused into the skin. An OxyGeneo™ treatment feels like a massage for the face. The exfoliation is described as very refreshing and comfortable. Because there is no vacuum procedure (like with microdermabrasion or dermal infusion machines), the overall treatment is more soothing and relaxing. There may be a slight tingling sensation as the skin becomes more oxygenated but overall the procedure is very relaxing. Microdermabrasion is done “dry” compared to OxyGeneo™. OxyGeneo™ applies a nutrient-rich gel onto the skin giving you added comfort and cleansing. Also, the treatment gel is always fresh because the product is vacuum sealed for single use only. OxyGeneo™ does not require a vacuum suction, therefore, decreasing the risk of dilating small capillaries on the face which can cause redness. What Should I Expect After An OxyGeneo™ treatment? After the OxyGeneo™ treatment your skin will appear brighter, fresher, and of even skin tone. Pigmentation, sun damage, fine lines, and even acne will continue to improve with a series of treatments. Immediately after treatment, the skin will feel softer and smoother. Your skin will be revitalized, renewed, and gorgeous after just one OxyGeneo treatment facial. How Often Can I Have An OxyGeneo™ Treatment? Yes, the OxyGeneo™ treatment has no downtime and the skin looks and feels great right after the treatment. If you have an upcoming event, schedule your OxyGeneo™ treatment on the day before or day of for effects that will be well visible during the event. This treatment is perfect to look and feel great for an upcoming wedding or class reunion. Our nutrient-rich gels are named NeoBright™ and NeoRevive™. The NeoBright™ gel contains azaleic acid, kojic acid, and retinol. It is the recommended product for pigmentation, brown spots, and acne. The NeoRevive™ gel is packed with anti-aging ingredients such as hyaluronic acid, peptides, and retinol. This product will rejuvenate your skin immediately for glowing, radiant skin and also helps to reduce pores. OxyGeneo™ is a medical skin treatment utilizing active ingredients that can improve the quality of your skin. You will be thoroughly assessed in a full consultation before a treatment at Advanced Laser Clinic. The OxyGeneo™ is tolerated by all skin types and ethnicities. Even sensitive skin will benefit from this treatment.